« Vegan Taste of Portland, Oregon: Restaurants, Street Food, and Cycling for Smoothies! Hi all! Another week flew by, so it’s time for an update on what’s happening in the Vegan Runner Eats headquarters. Before I proceed to tell you about the delicious vegan Japanese Sweet Potato and Chia Seed Pancakes, let me share with you the amazingly freeing running experience I had yesterday. You may remember from this post that I decided to stop running for a while in an attempt to give my left foot a chance to recover from plantar fasciitis. After not running for a couple months, I slowly started using a treadmill once or twice a week to run shorter distances – the treadmill belt is softer than asphalt, which provides less impact. My treadmill experiments lasted for over a month until finally I decided to try running outside again yesterday. 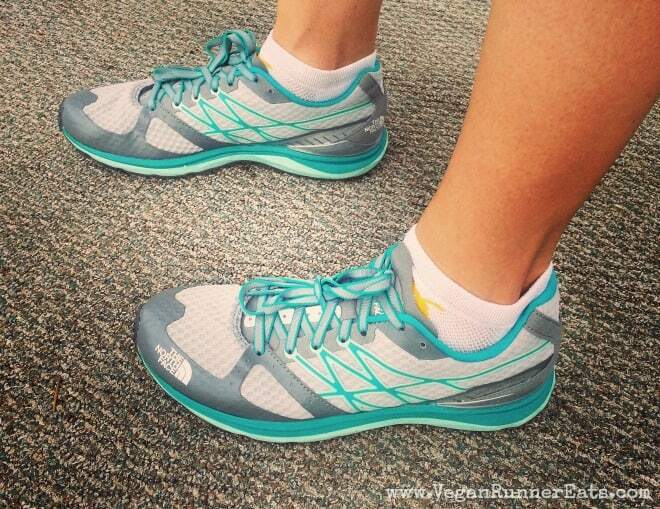 The best part – I got to try out my new running shoes (in the pic above)! I’ve never bought any shoes from The North Face before, but when Rob and I found ourselves in Portland, OR a couple weekends ago, we went into REI store that offered a vast selection of shoes for outdoor activities. Since I’m too cheap to have running shoes for separate occasions (hiking, trail running, working out at the gym), I tried to find a shoe that could work for all types of activities. My choice fell on these Performance Running Shoes by the North Face – they have a decent Vibram grip on the bottom of the sole to avoid slipping, yet their lugs are not so thick that they could compromise road running. Plus, they are very light and compact on the feet. So yesterday I made my big outing of 4 miles outside for the first time in almost three months! The fresh air felt really good after an eight-hour workday in an office that routinely gets too hot in the afternoon. To make my run even more enjoyable, I left my GPS watch at home (its wristband was broken anyway) – this way I was able to free myself from worrying about my pace and mile splits and just focus on the surroundings. If you are used to running with all types of gadgets like earphones and a GPS, I highly advise that you leave them behind every now and then: you’ll be surprised how great that feels! As the night went on, my left foot didn’t give me any significant trouble, which I took as the sign that the worst of my plantar fasciitis experience was behind. As long as I don’t start running too much sometime soon, I hope my foot will be fine. Now – on to the pancakes! A couple weekends ago I decided to experiment with making a new type of pancakes for our casual Saturday breakfast. I wasn’t in the mood for searching for recipes in my cookbooks or the world wide web, so I basically just threw a bunch of stuff together, and this deliciousness came out! I had a baked Japanese sweet potato that I had cooked the day before for Rob, but he came home from work too late and ended up skipping dinner. So a quarter of that potato went into the bowl… followed by some quinoa flour that I had bought too much of to make Kathy Hester’s vegan macaroons from this post. Also, I decided to skip using my regular flax seed egg – Rob had commented a few times that he didn’t like the smell of ground flax, even though I can’t smell anything – and substituted it with some good ol’ chia seeds . If you’re not familiar with chia seeds, they are gaining lots of popularity in the healthy eating world for their Omega-3 fatty acid content, plus they seem to be much easier to find in stores these days (or maybe it only seems so to me because I moved to the Pacific Northwest?). Don’t have quinoa flour on hand? Feel free to use an equal amount of whole wheat flour instead. You can substitute a cooked Japanese sweet potato with a regular sweet potato or even a white potato. If you’re using a white potato, you may want to add 1 Tbsp of sugar extra. No time to bake, boil or steam your potato? Just microwave the whole thing for 3 min, carefully cut in half, and spoon out the needed amount. Chia seeds tend to absorb a lot of moisture as the batter stands. If this happens to your batter, just add 1-2 Tbsp of non-dairy milk. 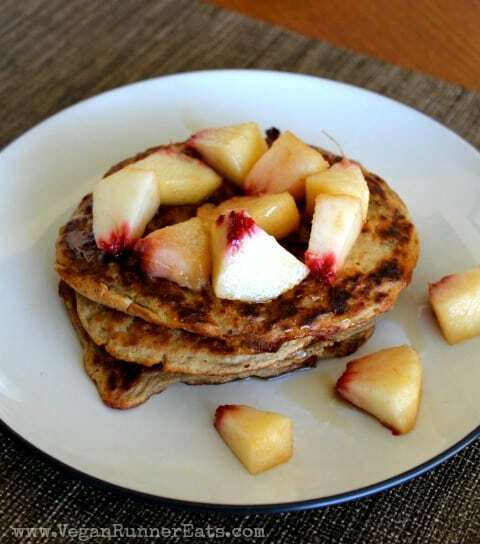 Tasty and healthy, these vegan pancakes are perfect for a relaxed Saturday breakfast. Serve with your favorite toppings - real maple syrup, fresh fruit, etc. Mix chia seeds with water in a small cup, set aside to let the mixture form a jelly-like substance. If the mixture gets too thick in 2-3 min, add another tablespoon of water. In a medium bowl, mix together all of the dry ingredients, set aside. Add cooked Japanese sweet potato to a large bowl and mash it with a fork. Add the rest of the dry ingredients along with chia seeds, mix well until the mixture is uniform. Heat a nonstick pan** over medium heat. Add dry ingredients into the bowl with wet ingredients, stir until just combined – a few lumps are ok. Once the pan is heated, pour about 1/4-1/3 cup of pancake batter onto the pan. (It’s ok to cook 2-3 pancakes at a time, but try not to overcrowd the pan as they may take too long to cook through.) Cover the pan with a lid, reduce the heat to medium-low, and cook the pancakes for 2-3 minutes, then flip them carefully and cook for 2-3 min more. Repeat until you run out of batter. Serve the pancakes with any toppings of your choice – maple syrup, peanut butter, sliced fruit, berries, etc. Enjoy! *In case you don’t have a Japanese sweet potato on hand, you can easily substitute it with regular sweet potato, or even a white potato – add 1 Tbsp extra sugar if using a white potato. To cook the potato, you can either steam, bake or boil it in advance, or microwave the whole potato for 3 min if you’re pressed for time. See more tips above the recipe. **I usually use 2 pans at a time to cook the pancakes quicker. Question: What’s your favorite breakfast recipe for a relaxed Saturday morning? This post is featured in Virtual Vegan Linky Potluck over here. Tagged pancakes, running, running shoes, vegan breakfast. Bookmark the permalink. Ahhh, weekend breakfasts! My favorite meal of the week! Thanks Annie, love the potluck idea! Thanks Chitra, chia seeds make a great substitution for other egg replacements. As someone who has suffered from plantar fasciitis, I feel your pain (literally and figuratively). I don’t know if you’ve ever heard of the Graston technique, but I went to a fantastic pt who used it. He managed to get me from a state of constant discomfort to training for a marathon within a few weeks. These pancakes look like the perfect breakfast for a post-long run day! That’s a great suggestion, Cookin Canuck! I’ve heard about the Graston technique but haven’t tried it – looks like I should really give it a try. 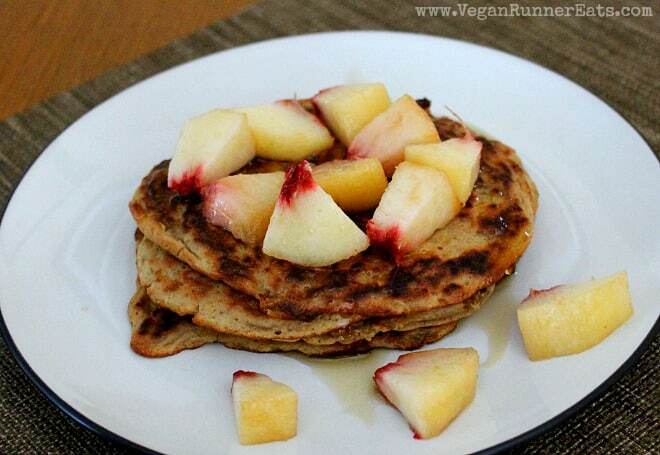 And yes, these pancakes would be a perfect post-workout treat!